Moving to actively counter China’s infrastructure ‘offensive’, India will build a crucial cross-border rail link between Kathmandu in Nepal and Raxaul in India, connecting the Himalayan nation to the Indian rail system, while separate inland waterways could give the landlocked country a route to the sea. Announcing the decisions after a meeting between PM Narendra Modi and Nepal’s newly elected PM K P Sharma Oli, Indian foreign secretary Vijay Gokhale said the rail link project should be a “game changer” in Indo-Nepal ties. The two nations agreed to speed up three pending cross-border rail links and complete two others this year. A joint statement said developing waterways was a “landmark” decision that will facilitate movement of cargo, within the framework of trade and transit arrangements, and provide additional access to sea for Nepal. “This new initiative would enable cost effective and efficient movement of cargo,” the statement said. The cooperation on waterways is significant in the light of previous political hurdles to cooperation in river projects despite several Nepal rivers draining into India and the potential to exploit hydel power and check environmental damage due to flooding and maintaining ecological flows in the lean season. With Oli’s pre-visit comments about Nepal having “two neighbours” clearly indicating he is ready to do business with China, the Indian infrastructure outreach seems intended to more closely enmesh Nepalese and Indian economies and ease and expand movement of people and goods at the borders. 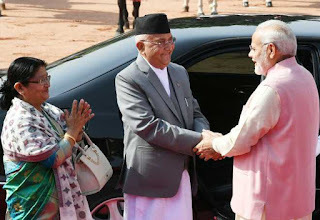 The Modi-Oli meeting could succeed in erasing some of the bitterness in ties since the border blockade of 2015 due to the Madhesi agitation when Oli was previously PM. The two countries agreed to speed up implementation of projects in Nepal, a fact borne out by the 2018 Budget in which India raised its outlay for Nepal by 73%. 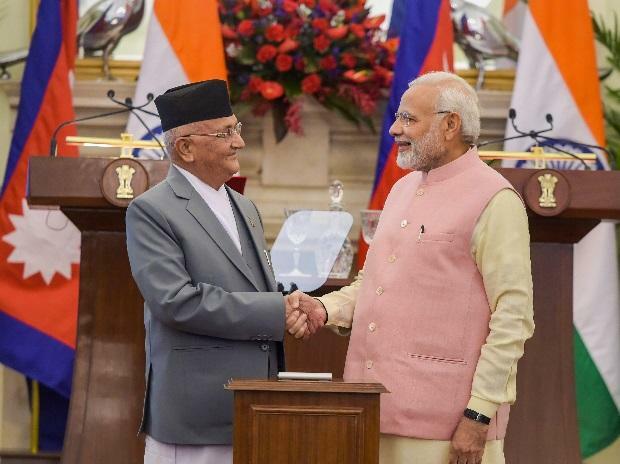 The India-Nepal statement said Modi “assured Oli that India remains committed to strengthening its partnership with Nepal as per the priorities of the government of Nepal”. Oli said, “We want to erect a strong edifice of trust-based relationship between the two close neighbours that we are.” Modi reminded Oli that he should include all sections of Nepalese society. Oli met Modi once on Friday and a second time on Saturday. The two PMs inaugurated an integrated check post at Birgunj and a petroleum product pipeline between Motihari and Amlekhgunj. Modi accepted an invitation to visit Nepal, and Gokhale said it would happen this year.